The M12TX 100Ω RTD sensor with built-in transmitter can be programmable by a computer. The configuration kit required for programming is M12TX-CONFIG. 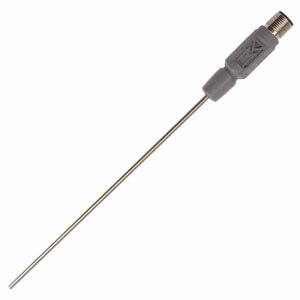 This unique probe is ideal for areas with space limitations where traditional head connections are too large to fit. The M12 thread design offers a secure industrial connection. The temperature Transmitter is designed with mineral insulated cable probe (MgO) which allows the probe to have a minimum bend radius of three times the diameter. Response Time: Diameter 3 mm <3.5 second, diameter 6 mm <13 second (test in water to IEC751- time for reaching 63.2% of instantaneous temperature change) three times the diameter.